Method to the Mayhem: Mayhem Studios featured in Mark Schaefer's New Book "Return on Influence"
Mayhem Studios featured in Mark Schaefer's New Book "Return on Influence"
I'm featured in Mark Schaefer's new book, "Return on Influence." It was an honor to be included in the book as one of the case studies; about online influence, social scoring and Klout. It was also an honor being featured on his lectures and slide presentations during his book tour. 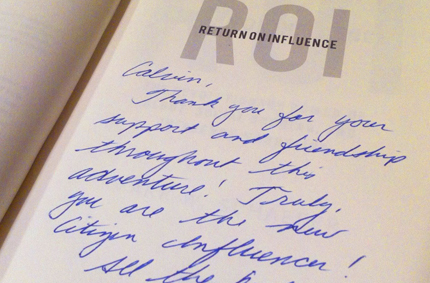 Return on Influence shows you how to measure, adapt, and grow your influence online using groundbreaking new technologies and field-tested marketing tools. It's a step-by-step guide that shows you how to take advantage of social scoring systems to measure online influence, harness it, and leverage it for your business. 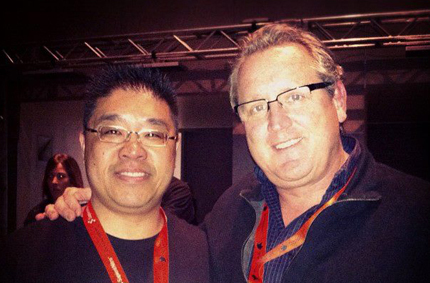 It was awesome meeting Mark Schaefer in person at SXSW. You can pick up Mark's new book at Amazon.